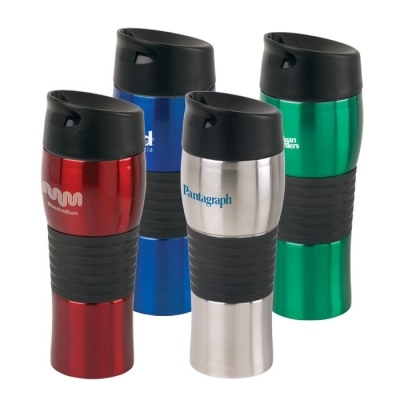 Vacuum Insulated Starline Java stainless steel dual wall tumbler with a silicon non-slip band. Minimum order with your imprint, 24. Quantity variation +/- 5% is possible & billable. Double walled vacuum insulated 20 oz stainless steel tumbler, with patented leak-proof lid. Made entirely of FDA approved materials. Has a comfortable silicon non-slip band for safe holding. The design has lip and finger grooves to let you position the drinking spout without even looking. Lid: Screw-on style for smooth operation. Non-leaking. Has a visual open/close push button locking closure. Easily comes apart for care-free cleaning. Materials: 18-8 Stainless Steel dual wall. Vacuum insulation. The price includes your imprint in 1 location, laser engraved or 1 standard imprint color. Imprinting Methods: Screen Printing or Laser Engraving. Option: Additional locations. Email for details. Option: Full color imprint, up to 3 sq. in. Option: Full Color wrap around imprint. $0.24 per sq. in. per piece.